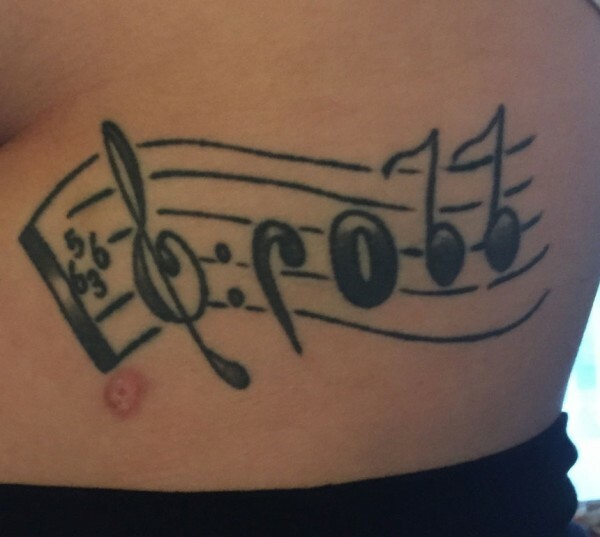 In the year since I first wrote about cliché-free memorial tattoos for Modern Loss, I’ve encountered people’s ink tributes in bathroom lines at concerts, at book readings and all over the Internet. 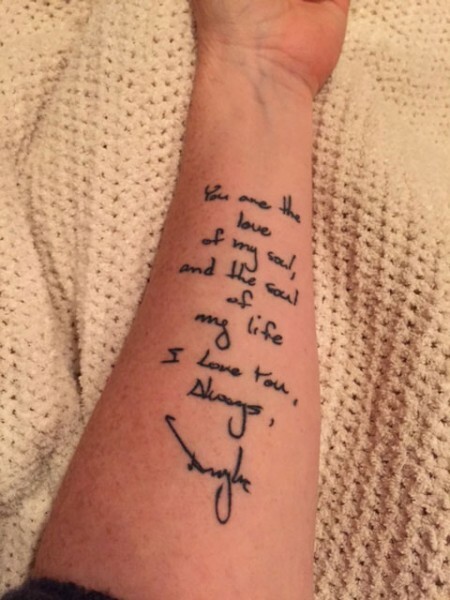 I’ve heard about a wedding party who got a mass tattoo for a late groom and from a reader who inked the title of my memoir on her forearm to honor her late brother. I confess that I’m still contemplating tattoo designs for my late husband and brother, but not for lack of exposure to meaningful, aesthetically stunning tributes. The memorial tattoos included below reach beyond rose-wrapped crosses and words like “R.I.P.,” and into the realm of the remarkably personal. Some take a high-design approach and some are unassumingly simple, but all use unexpected symbolism to honor the deceased. Who does your tattoo memorialize? My father, Gary R. Parker. How did you lose him? In a tragic skiing accident. Did you get the tattoo on a significant date? No, the timing was based on the artist’s availability. My dad often wore ties, so I chose several from his closet that had design potential for a tattoo. 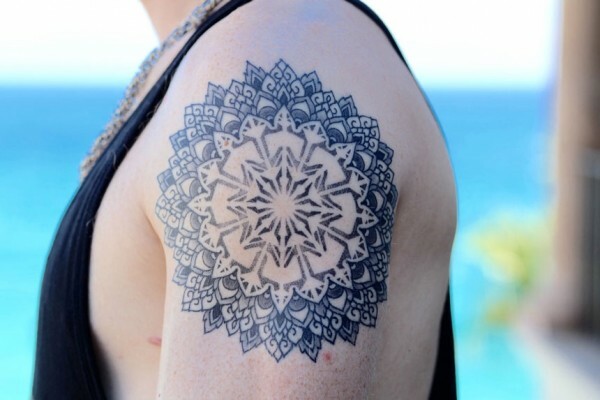 Then I asked the artist to create a mandala inspired by those ties. Current City: Santa Rosa, Calif.
Tattoo Artist: Brandon Bartholomew of The Hole Thing in Santa Rosa, Calif. Following my college graduation, and almost exactly one year after he passed. My dad was a musician and loved music. The design is his first name, “Scott,” represented in musical symbols. The numbers indicate his birthday (June 5) and death day (June 3). I chose to place the tattoo on my left ribcage so it would be close to my heart. Metastatic brain tumors. He fought for 14 months and endured five brain surgeries before losing the battle. On March 31, 2014, after a bout of depression left me contemplating suicide. 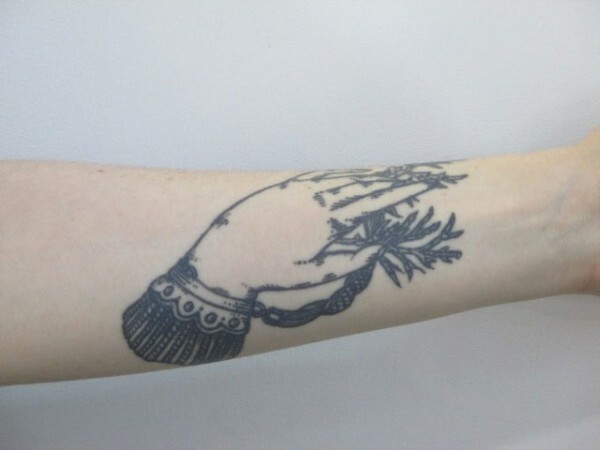 In order to feel the pain of slitting my wrists — so I’d never do it — I decided to get a tattoo there. The act of tattooing represents curbing my desire to end my life (and the pain) after losing my husband. Literally, the three birds represent the three souls lost: his, mine, and our 19-year old cat who died two weeks before Riccardo did. 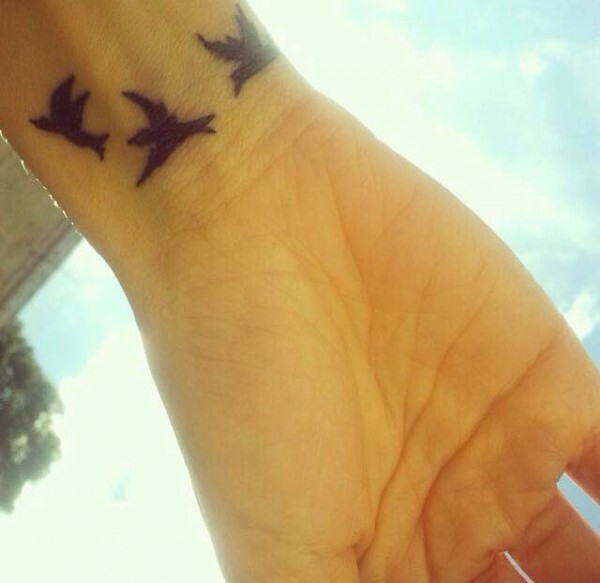 But it also symbolizes the hope of flying away and finding a beautiful life after tragedy. Tattoo Artist: Sue Jeiven of East River Tattoo in Brooklyn, N.Y.
My daughter, Roxane Persephone Chinn. I was 40-weeks pregnant, and it was our due date. Late in the afternoon, I became aware that Roxy wasn’t moving as much as she normally did. I attributed it the fact that she was full term and had pretty much run out of room. We called the doctor, and she had us come in for an ultrasound. We arrived at the hospital, but they could not find a heartbeat. After I delivered her the next morning, we saw that there was a true knot in her umbilical cord that had probably formed very early in the pregnancy. It took time to decide that I wanted a tattoo (this is my only one) and once I did, to figure out what I wanted. After that all became clear to me, though, I wanted it as soon as I could get an appointment with Sue. The date itself wasn’t significant, but the act definitely was. Once I decided that I wanted to commemorate Roxy in this way, I began researching ideas. I knew that I wanted something beautiful that wasn’t immediately recognizable as a memorial tattoo. I began looking at Victorian mourning jewelry (no one has done mourning like the Victorians) and found a beautiful brooch with an outstretched hand holding some foliage. This symbolizes remembrance. I changed the foliage to Cyprus branches, which is what we had carried at Roxy’s memorial. When I met with Sue, she was thrilled by the idea of using Victorian mourning symbols for this and suggested the addition of the hair jewelry piece at the bottom. The Victorians would cut the hair of their dead and weave it into incredibly intricate pieces: bracelets, brooches, rings, and even tiaras. We decided on a bracelet that attaches to the cuff of the hand and disappears into the Cyprus. This is another symbol for remembrance but it also reminds me that Roxy was born with a full head of beautiful, dark hair. Current City: Colorado Springs, Colo.
Tattoo Artist: Ron Dolocek of Lucky Devil Tattoo in Colorado Springs, Colo.
My only brother, Johnny Schell. I chose the month of February since that’s the beginning of our astrological sign’s timeline. My brother and I had a bond that allowed us to communicate with a look and through humor that only we understood. When I lost him, I was devastated and went through a period of drug and alcohol use. I couldn’t stop thinking about what I could have done to change things. I didn’t want to stop thinking about Johnny because I thought if I did, he would disappear and I’d have nothing. But after I read the book [by the author of this column] “Splitting the Difference,” I realized that keeping my brother’s memory alive didn’t mean living my life for him and it didn’t need to come at the expense of my health. I could still love him, miss him and talk to him without destroying myself in the process. 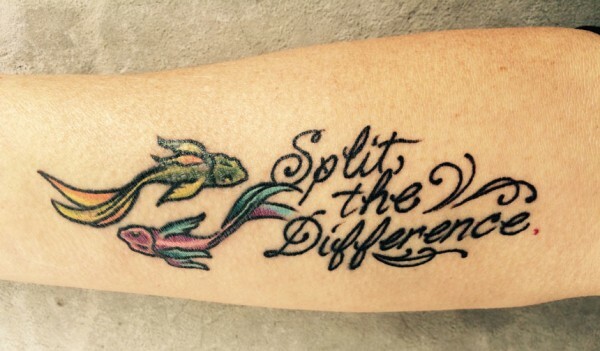 So the tattoo’s phrase refers to my choice to “split the difference” between losing him and losing myself. Johnny was a Pisces like I am, so I chose the two fish that symbolize our astrological sign. He was born on St. Patrick’s Day so the fish representing him is green; my fish is purple because my February birthstone is amethyst. The color of my fish also ties back to a pair of amethyst earrings that Johnny gave me when I was a little girl and he was a cadet at the U.S. Military Academy at West Point. Current City: Kansas City, Mo. Tattoo Artist: Chris Orr of Mercy Seat Tattoo in Kansas City, Mo. It was close to what would have been our seventh wedding anniversary. On our wedding day, Oct. 1, 2005, my soon-to-be-husband gave me this handwritten card before we walked down the aisle together: ‘You are the love of my soul, and the soul of my life. I love you, Always, Douglas.’ He had a way of capturing the feelings that we experienced together, and these particular words from him remind me of the undying connection we have and the beautiful love we shared. It reminds me that a connection like that is real, can be real again and not to settle for anything less. It’s a daily message in his handwriting about the possibilities of love…a permanent love note directly from him.